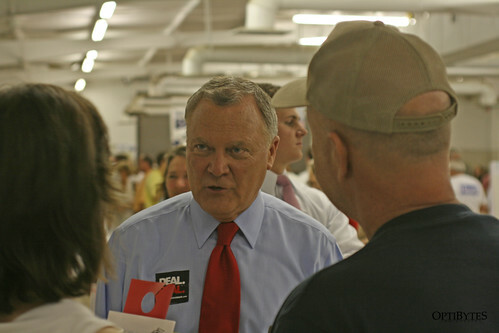 I attended “Constitution, Candidates, & Your Vote” presented by The Georgia Tea Party this evening. 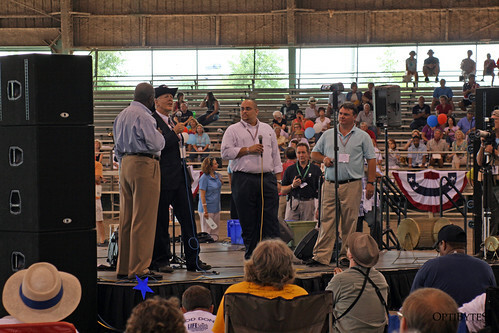 I had an awesome time mingling with my favorite candidates, listening to Herman Cain, and chatting with good friends. The event was held at Jim R. Miller Park in Marietta, from 5pm to 9pm. I arrived just after 5:30 and wasted no time getting to the candidate “bullpen” to see who I could photograph. 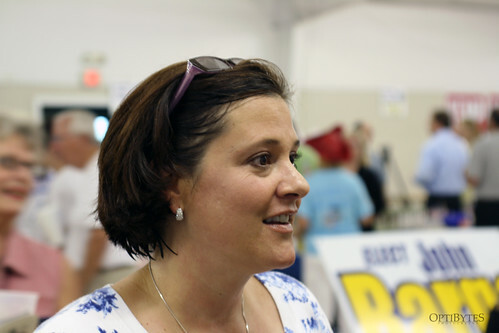 The first candidate I saw was Kira Willis, Libertarian candidate for State Superintendent of Schools. She got my vote earlier today when I left all of the choices for superintendent blank on the primary ballot. 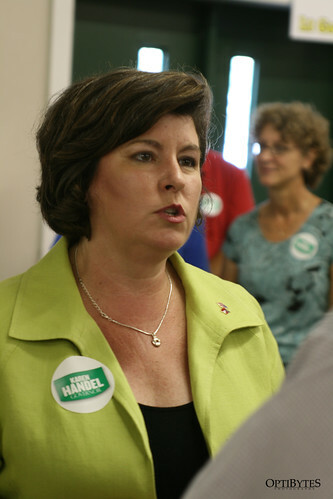 According to the news media, Karen Handel is doing well in the polls, and it looks like the primary may come down to a run-off between her and Nathan Deal. I didn’t see Eric Johnson at the event, I am not sure if he was able to attend, but you couldn’t miss seeing John Oxendine. Everytime he opened his mouth there was a bright glow in the bullpen. Is it me or are his teeth un-naturally large and artificially white? By far, the most disgusting experience of the evening was when I was greeted by another candidate who had abnormally sticky and slimy hands. 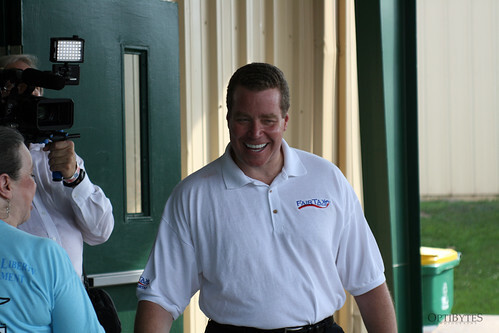 The next time I attend an event like this, I am bringing a gallon of Purell. I can put up with a lot from people, but this is just disgusting. 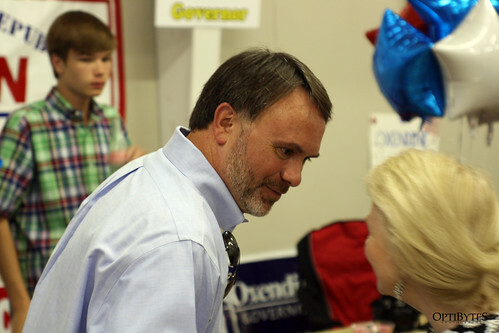 Of course, there were many bright spots (and I am not talking Oxendine’s teeth) in the candidate’s area. 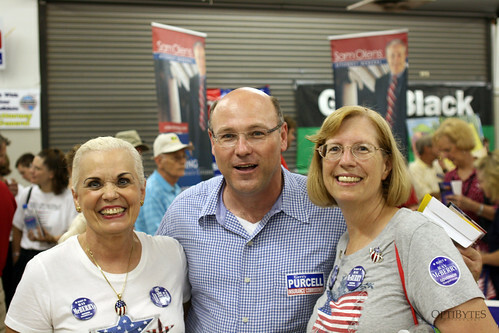 Gerry Purcell, candidate for Insurance Commissioner, was there. He was greeting people, answering questions, chatting with supporters, and posing for photos. 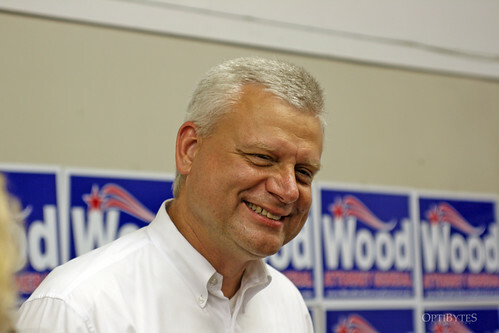 The next Attorney General for the state of Georgia, Max Wood, was on hand to listen to voters and remind people why we need someone like him in that office. I spent far too much time in the bullpen, but as soon as Ray McSlimy shook my hand I had to leave in search of hot water, or at the very least someone with a bottle of Purell. I quickly took my seat in the bleachers with the gals from the Douglas County TEA Party, Brenda, Beth, and Teresa. 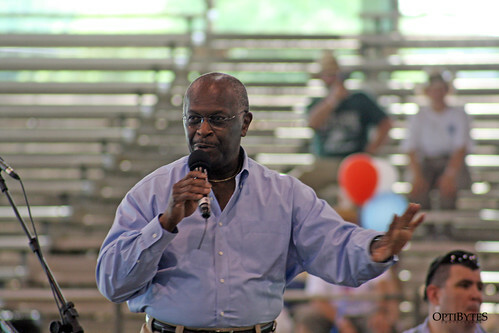 We listened to Herman Cain as he did his live show, and spent the evening chatting about all things “local”. Or was that “loco”. Hmm. I forget. So I am sitting here tonight, at almost midnight, and I just realized I have to be out the door around 7am for a camera club field trip. You can see the rest of the photos I took on my Facebook page or my Flickr page. If you need the link, it’s at the top of the page.